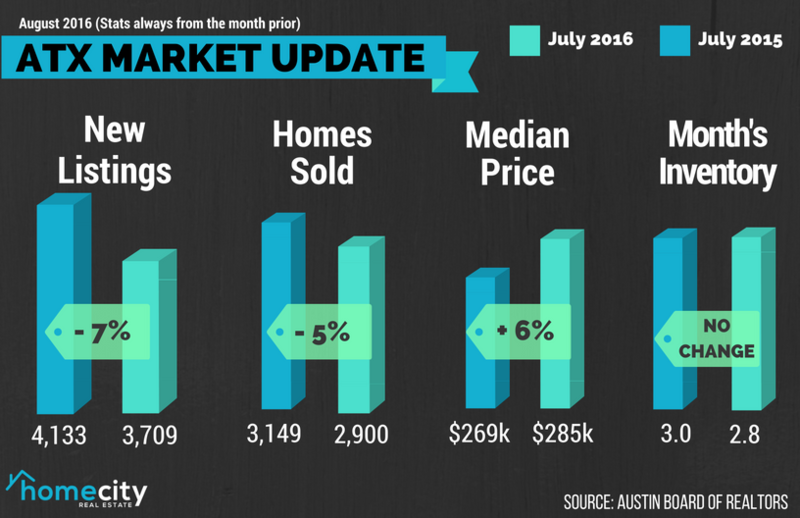 Austin Home Sales are Slowing Down… What Does It Mean for YOU? Despite having the strongest summer selling season in our region's history, home sales are starting to slow down. The culprit is likely the rapidly rising home prices in the area. While this is great news for homeowners, higher home prices can also lead to affordability issues, and also a cooling of the market. The Austin Board of Realtors cites in their monthly market statistics a 5 percent decrease in single-family homes sold in July 2016 at 2,900 homes. The median price of homes in the Austin area was $285,000 in July (when the latest stats came in), which is a 6 percent increase from the same time the year prior. At the same time, inventory levels remained unchanged at 2.8 months and homes spent 40 days on the market on average. ABOR reports that homes between $100,000 and $200,000 were selling very quickly, with less than one month of inventory available at most times. However, homes above $400,000 had more than four months of inventory available. In Austin proper, the median price for a single-family home hit $354,000, a 4.6 increase from July 2015. However, sales volume declined 7.3 percent to 870 homes sold. Inventory rose from 2.1 months a year ago to 2.4 months, which is a slight increase yet still well below what is considered a balanced market.